Universal, compact, easy to use! Universal, compact, easy to use – this Compact Vertical Bike Rack is one of the coolest and most convenient wall mounted bike racks available. One of the best features of this bike rack is its compactness with and without a bike. When your bike is not being mounted, then the arms simply fold up and out of the way leaving a minimalistic footprint on your wall. Because of the unique way it stores your bike vertically, even when you do have your bike mounted it takes up very little room. Another awesome feature of this bike rack is its ability to swivel! Not only do you get a unique, compact way to store your bike, but you have options as to what angle you want your bike to stick out from the wall. If you would prefer that your bike doesn’t take up much room sticking out away from the wall, then simply swivel the bike out of the way so it lays flat up against the wall. 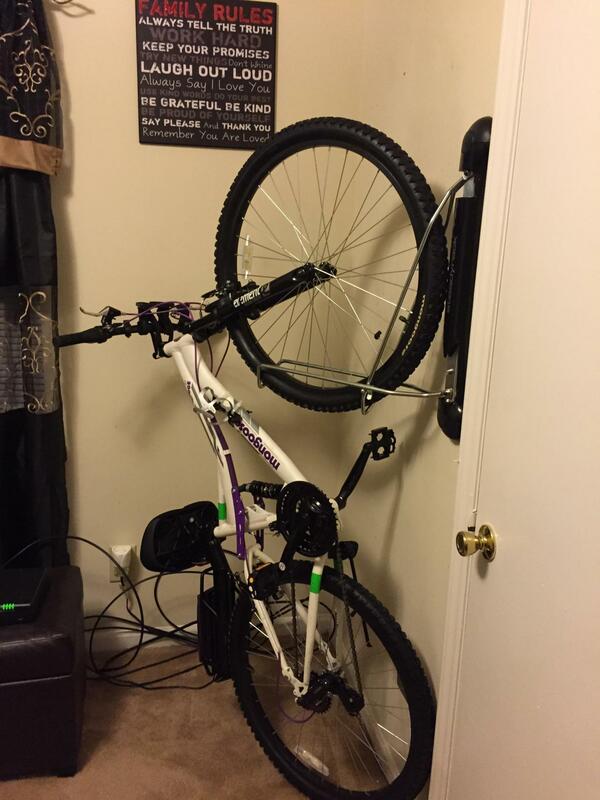 If you need more space along the wall, then simply leave the bike mounted as is, or pick any angle in between! Whether it’s a road bike or a mountain bike, this wall mounted bike rack can handle your bike (75 lb storage capacity!). The Compact Vertical Bike Rack’s ingenious design doesn’t require you to do any heavy lifting of your bike, making it an excellent option for children or people who have trouble lifting their bike into high places. In fact, the rack’s tire cradle is specifically designed to assist you in positioning your bike into the proper storage position. Get organized – easily! 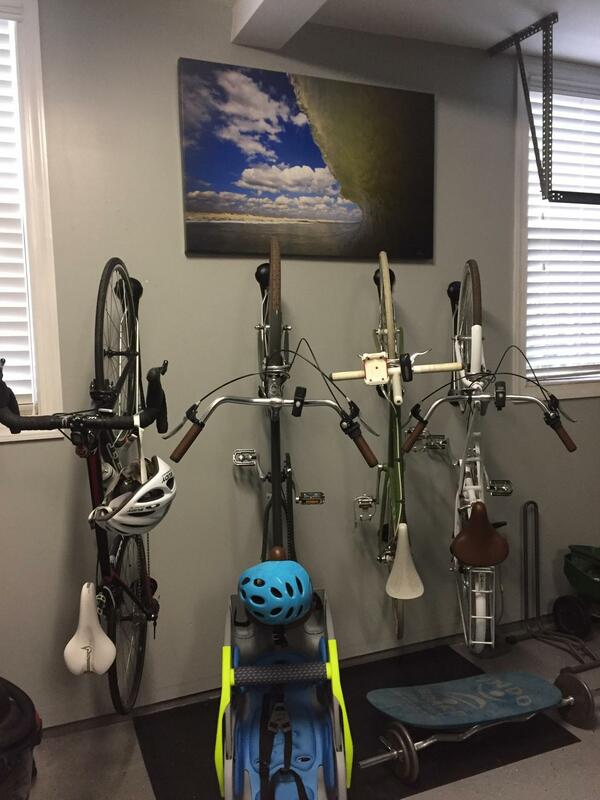 The Compact Vertical Bike Rack is a simple and effective way to get your garage, shed, or any other storage area neat and tidy by storing your bikes. Whether you’re a big family with a lot of bikes, a road bike enthusiast, or a small bike shop, the Compact Vertical Bike Rack is designed so that it can be installed side-by-side. This allows a large number of bikes to be stowed away in a safe, secure, and clean looking design. Have a bike with a fender? Check out the fender version of this rack. Have a fat tire bike? Check out the fat tire version of this rack. Hardware included: 4 bolts, 2 screws and 6 drywall anchors. Does this mount come with the piece that goes under the back wheel to protect the wall? Yes, this vertical bike rack comes complete with a bottom bracket for the rear wheel of your bike. It also is complete with all mounting hardware needed to install it in either wood or masonry walls. Is there a way to lock the bike when mounted? Our compact bike rack does not include a locking mechanism, however you could probably use a cable lock to secure it, if not to the rack, to maybe putting an anchor point on the wall, such as an eye bolt - and then lock the bike to that. Can this fit a Fat Bike with 4.5" tires? This vertical rack is not going to work out for your tires. For that size tire, probably none of the racks that hold the bike by the tire are going to work out, so a wall mounted rack like the ones seen here or here might be something to consider instead, though they are going to store your bike horizontal. What would you recommend as a minimum spacing between bikes? You can install these racks as close together as your bikes will allow, just make sure you check the width of the handlebars first so they don’t clash when mounted at right angles to the wall. You can install them closer together if you stagger the height along the wall so that the handlebars and pedals don’t clash when the bike is mounted at right angles to the wall. And you need to remember the higher the bike is off the ground the more difficult it is to mount in the rack. Those are really the only specifications for spacing, though we have a planning & use guide available herefor reference. Will this work with a tire that is 1.75" wide? 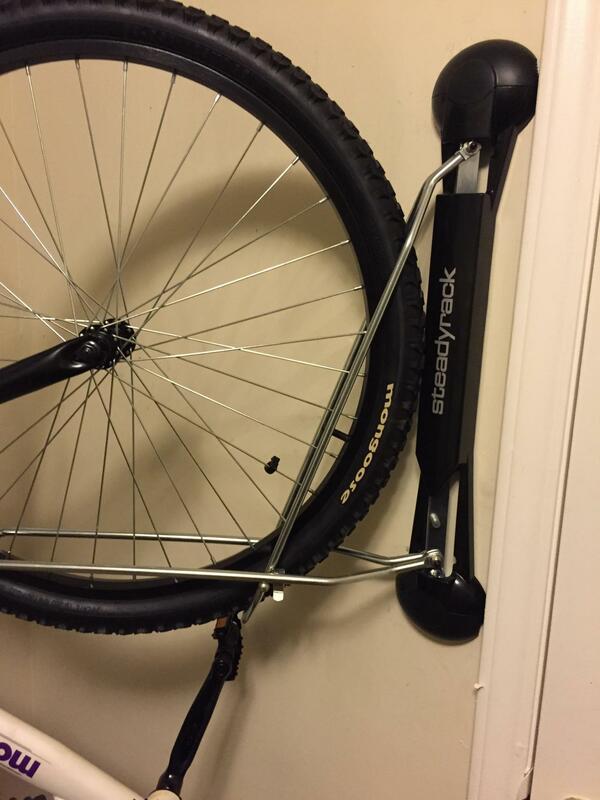 Our vertical bike stand's smallest slot is 2 1/4th inch, but that should fit your tire fine. Does this mount need to be attached to a stud? Yes, our vertical bike rack should ideally be mounted into your wall stud, to properly hold the mount and your bike. Any problem with this rack handling 29er wheel size and a 2.3 tire? Could it handle up to a 2.5 tire if we went larger? Our Compact Vertical Wall Rack is intended for tires up to 2.2" inches; it has a Fat Rack version that works for bikes with both fatter tires and diameters. The Fat Rack works for tires that are 2.2" to 5" wide, which sounds like it would be a better fit for your mountain bike. There is a comparison chart of the three types of this rack available on our listing, in case that helps clarify further which might work for your bikes. Can I leave it at a non-90 degree angle all the time? I'd like to keep the bike as flat to the wall as possible. Our Steady Rack is not really designed for outdoor use - it is not made from stainless steel, so would be subject to corrosion outdoors. Does the Classic Rack fit a 27.7" (650b) wheel? The wheel width is 2.0". Our Compact Wall Bike Rack will fit a tire up to 2.2" wide - so your tire is near that limit/specification, though it should fit them. If its much wider than 2" you would need to look at the Fat Tire version that fits tires up to 5" wide. Yes, the steady bike rack would be fine for children's bikes, as long as they have tires that are no wider than 2.2 inches wide. I need to order 2 vertical wall racks but didn't see where there was an option for the tires with fenders. The vertical rack for bikes with fenders is at another listing, seen here: https://www.storeyourboard.com/fender-bike-wall-rack-swivel-vertical-storage-mount/. Do you have to use a stud in the wall for installation? For these Steady Racks, it is ideal to mount them to the wall studs, though they include anchors if you don't have wall studs. Will this rack work for a recumbent style or for a Day 6 bike? It is likely a recumbent or a Day 6 type bicycle would not work on the Steady Rack, due to their shape, but still possible they could. The rack holds the bike by its front wheel, and fits wheels that are up to 2.2" wide, so the front tire would need to fit there for starters (there is a fat tire version that will hold a larger wheel up to 5" wide). If the front wheel could fit in those type of slots, the main concern would be weight, in case either type is a particularly heavy bike, as it holds bikes up to 75 lbs. Then the additional concern would be the shape of the frame; for the Day 6 bikes, I would be a little concerned that the back rest would interfere with the way the bike sits in the rack, causing it not to be balanced well. If the rear tire is a very different size then the front tire, on the recumbent, then the bottom tire rest may not work for it. All that being said, if the wheels fit, and they are in that weight specification, it just may work - I just can't guarantee it, unfortunately, but hope that gives you some ideas for whether it might be worth trying for one of your bikes. For someone that cannot lift bicycles an inch of the ground, is the ease of this wall mount rack sufficient? This is an easy bike rack to use, and actually relieves one of some heavy-listing, but it does require you need to lift the bike up onto the mount, and that will be more than an inch off of the ground.... that being said, the way the bike is positioned into the mount generally helps assist you, so it can be used by people that otherwise may have some difficult lifting a large item. How much distance on a wall do I need to have between two racks? I am trying to figure out how much width it will take to store two bikes in a closet 30" deep. For this compact bike rack, you are going to need a little bit over 19" inches between the racks, ideally, so over a foot and half of space between them. That allows you to take advantage of the pivoting/swivel feature of the rack, which helps getting the bikes on & off the racks, and helps prevent the bikes from getting handlebars etc. in the way of each other. That would give you about 10 inches on the other sides of each rack in a 30" space., so I am really not certain it could work. If you place the racks at different heights, you can place them a little closer though, so that may be an option to look at. On the listing there is both a planning guide and installation instructions, under "Helpful Items," in case that gives you some more ideas on whether they could fit in there together. Can I hang a bike with a fender with this rack? No, this Classic Steady Rack does not work for bikes with fenders. 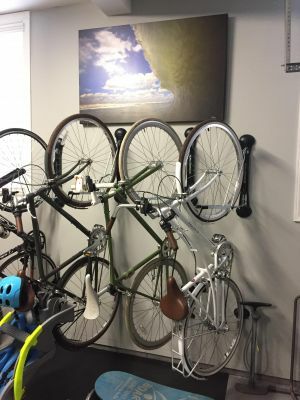 You would need the fender version, seen here: https://www.storeyourboard.com/fender-bike-wall-rack-swivel-vertical-storage-mount/. The racks were easy to install and are keeping our bikes stored in minimal space due to the ability to pivot them to one side or the other. Ordered 4 of these to get my bikes out of the way when not in use. Easy to install. Robust design. Love the fact you can angle your bikes creating even more room. great looking rack, works perfect on regular bikes & works good along with the fat tire rack we ordered! the fold over to the side feature is GREAT! My wife and I have 2 bikes each, and space is limited in our garage. These racks were easy to install and are very easy to use. My wife likes not having to lift her bike at all to get it on the rack, and when we turn them to the side, they extend less than 15" from the wall. Great product! Awesome and quality design that lets you store bikes closer together and save space. Super easy to install and taking a bike on and off the rack. Love the fact that there is only contact of the rack with the tires. Love the way these are hanging in my garage. Simple install and easy to use. Only wished my garage didn't have the large cement edge on floor,so I could just roll bike in. Have to elevate bike slightly which is not that big of a deal since the steady rack grabs the tire right away. The rack is sturdy and convenient. However, mounting it to the wall requires at least four very large screws, which is a problem when walls are concrete or other similar dense, rigid material. Great product, though a bit pricey. My bike took up so much space in my spare bedroom, so I was delighted to finally put it up on the rack...I love it...it was everything I was hoping for...KUDOS.. I live in a apartment, it's a nice size w/2 bedrooms...this purchase was perfect for me, because I definitely wanted to get my bike off the floor taking up so much space. I love it, KUDOS! We purchased 2 of these racks and mounted them easily in our garage. Our bikes slide into the racks conveniently. What I especially like is that the bikes can be swivelled from a straight, perpendicular position to either the left or right at an angle, so if space is tight, there is easy entry or dismantle to and from the rack. The construction appears sturdy and of good quality. I would recommend this product. This rack is well built and stores my 29er with ease. I love the swing aspect for space saving.